What a Christmas wonderland this place is 🎄 last week we went to Lake Tahoe with the kids,and another family. It was snowing and looked so magical!! A first time experience of watching falling snow made it even more special. 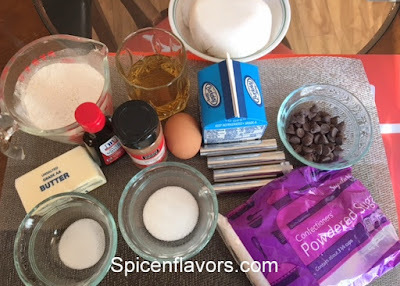 I had planned to make some snow flakes cookies to take along with us. The children had an even better plan, of making us a Christmas Eve dinner, that turned out so grand and made us all so happy! Lake Tahoe , is in Nevada and bout 4 hours drive from SanJose, California. During winter, people love to take a trip, stay there and do winter sport and skiing. There is a place there called Emerald Bay, and the view you get to see is out of this world! There are many lodges, vacation homes available but do book in advance! 1. In a mixing bowl and using an electric hand beater, start by smoothing the butter, add sugar and continue mixing with hand mixer, till it appears creamy consistency. Now add in vanilla essence, pinch of salt, chop finely and add candied ginger and add in milk, mix together to form into a soft dough. As the dough starts to leave the sides,take it out and roll it into a ball shape and wrap it with saran wrap ( plastic wrap) and leave it in the refrigerator to cool for about 20 mins. 2. Dust a flat board with flour and roll out the cooled dough, by dividing it into two halves. Flatten each half into 1/4 inch thickness. Using cool cookie cutters, cut out shapes like snow flakes, Christmas tree , snow man! Sprinkle some sugar on the top, and bake them on a baking tray at 350 F for about 15 to 20 mins. Remove as they appear light golden brown on the sides! Cool and enjoy these delicious cookies, with some ice cream or just the way they are. I first tried these yummilicious cannoli's in a Italian area in Boston, when I went o meet my daughter who studies in Harvard in Boston. The store had a great display of cannoli's and enjoyed the taste, while sipping some coffee, that goes great with cannoli. 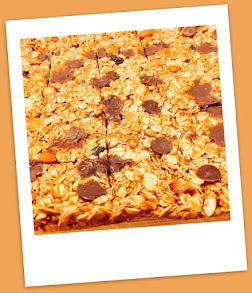 This made me want to search for that perfect recipe that would excite my taste buds and here it is tried and tasted!! 1.5 cup ricotta cheese ( strain the excess water out from ricotta cheese, you can use a muslin or cheese cloth and drain the water out) at least 30 minutes before using, refrigerate. 1. For the dough sieve together flour ,salt and sugar into a mixing bowl. Add the cold chopped butter, rubbing the butter into the flour with your fingers, till it appears coarse. Add in egg and mix in wine . Form a dough ball and flatten over a flat surface. Wrap a plastic wrap and allow the dough to cool. 1.Put the drained ricotta, into another mixing bowl, add sugar, vanilla essence and cinnamon. 2.Mix heavy cream with a whisk, and using a spoon gently folded cream into ricotta.Stir in chocolate chips and put this filling mixture into a pastry bag, that has no tip and refrigerate till ready to use. 1.Remove the plastic wrap, and place dough on to a flat surface, dusted with flour. Using a rolling pin, roll out a thin sheet of dough approximately 1/4 th thickness. 2.Using a glass bowl or any bowl that is about 2 to 3 inch in diameter cut out disc's of dough. 3.Using cannoli mold, wrap each cut out circle onto the mold.Seal the ends with a little egg wash, and flare the ends, this alos helps with the filling later on. 4.Heat oil to 250 F and using kitchen tongs carefully submerge the wrapped cannoli to cook the shells, on medium heat. Cook 2 to 3 minutes, and remove the cannoli mold from oil , using a tong onto a paper towel. Gently using a towel,hold the mold and slide off the prepared shell off the mold. 5.Repeat the process to complete making all the pastry shells. 1. Just before serving, using a pastry bag without a tip squeeze out the filling into both ends of pastry shell. Even you can use a ziploc bag, fill the bag with ricotta filling, seal from one side and clip off a slit on the corner of the other side. One can prepare the Cannoli's about 60 minutes before and refrigerate to enjoy later. Don't store filled shells for longer time as crispy shells is better. Navratri means nine (nav) night (ratri) in Sanskrit. Festival dedicated to the worship of the Indian diety Ma Durga. During these 9 days , nine forms of diety are worshipped. 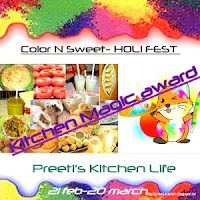 We prepare sweets and other vegetarian food for this festival. I am preparing coconut ladoos, as sweet start to Navratri. It is very easy and can be made by using coconut, condensed milk and ghee. 1.Heat ghee in a medium kadai. Add thawed fresh coconut, stir for few minutes. Do not brown the coconut. 2.Add cardamom powder, and condensed milk, keep stirring till all the mixture comes together. As mixture leaves sides of pan, close burner. 4.Rub a little ghee on palms of your hand, and take a spoonful of mixture to make small balls of ladoos. 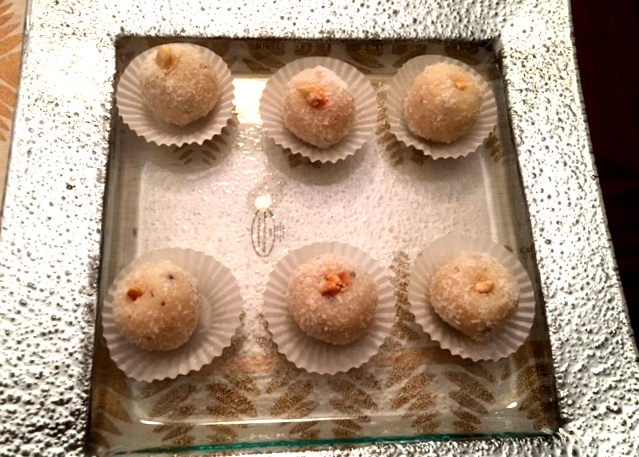 Roll prepared ladoos in dried coconut to coat the surface. 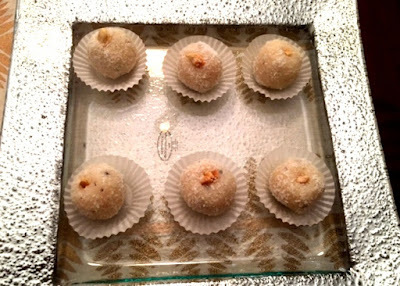 5.If you want you can add a dry fruit to garnish the ready coconut ladoos. Enjoy and store remaining ladoos in an air tight container or refrigerate to enjoy later. Thai coconut curry with Jasmine rice. Thailand is an exotic land, with amazing white sand beaches, blue waters, and a cuisine that is full of taste and flavor, with a spicy edge. There is plenty of sea food in their diet. Today I am preparing a popular Thai dish called Thai coconut curry with vegetables. As the name suggests, coconut is wildly used as an ingredient for cooking Thai dishes, this adds a creamy texture to their curries. The people in Thailand are very friendly, and they are very proud of their culture and beautiful temples. The massages are so relaxing and have therapeutic effect on one, and is a must when in Bangkok. 1.Heat 2 cups water, as water begins to boil,add washed 2 cups jasmine rice. Cook for about 15 to 20 minutes on medium heat. Close burner and drain the cooked rice.Add few drops of oil to moisten the rice. Keep aside. 2. Using a medium wok, heat 2 tbsp oil,add in onions, allow them to become slightly translucent. Add garlic, ginger and 1 tsp red chilly flakes. Next, add vegetables and continue cooking. 3. Add in curry paste, continue stirring over medium heat. Add soy sauce and now add 1 cup coconut milk, Allow the curry to cook further for another few minutes,add in 1 cup water and cook further for 5 to 6 minutes. Garnish with few sprigs of basil leaves. For Non vegetarian option, simply brown some boneless chicken cubed pieces, along with the onions. The other steps are the same. Enjoy this Thai curry with warm jasmine rice. Chocolate lovers favorite dessert. Easy to prepare and is gluten free too!! The baked cake comes out light,crisp on the outside and moist in the inside. The recipe includes simple ingredients, and is a perfect dessert for sweet indulgence!! 1. Preheat oven to 350 F . Using two bowls, separate egg whites from yolks, using a hand beater, beat egg whites till they form soft peaks.Keep aside. 2. In a medium bowl,add broken pieces of chocolate, add butter, stir together and microwave for 2 to 3 minutes, remove from microwave and stir to melt the chocolate. 3. Add egg yolks one by one to melted chocolate. Next I like to add coffee powder as it enhances the flavor of chocolate. Also add salt, and vanilla essence. 4. Add sugar to the beaten egg whites and next add this egg whites to the cake batter. Fold in the cake batter, don't over mix. 5. Dust a round cake pan, approx 8 inch in diameter, with coco powder. Pour cake batter and bake at 350 F, for 1 hour and to test if it is ready, put a toothpick in the cake, and making sure it comes out little wet but not too gooey. Cool the cake on a rack, and later dust with confectioners sugar on the top, and you can add some berries too for the added touch. Alternately, instead of putting confectioners sugar and berries, you can add vanilla frosting or other fruits of your choice too!